No game publisher has released more games on the DSiWare service than Gameloft. And while the company has received a wide range of review scores among their various DSiWare releases, no one can argue that they've brought some quality games to the service in the short time it's existed. 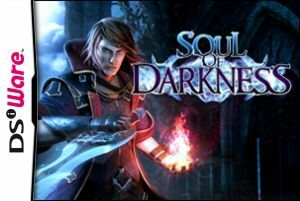 Soul of Darkness marks their 20th DSiWare release, and while the game obviously borrows heavily from the Castlevania series, it still manages to offer up enough new twists to help it stand out from the crowd somewhat. If you've ever played a Castlevania game, you should immediately feel right at home with Soul of Darkness. You're going to platform and hack your way through level after level, battling enemies with your spears and using your magic to help you navigate the game's tricky levels. While most of the levels are fairly linear in design, they do offer up enough exploration to keep you guessing, not to mention some areas where you'll really have to put your thinking caps on in order to keep progressing. You begin the game with a Fire Spear and as you work your way through the game's many levels, you'll begin picking up purple soul shards that can be used to level up your weapon. You can even determine which aspects of the weapon to level up such as its Combo power or even its level of magical capability. The more shards you collect, the more you can upgrade the weapon at the end of each level. As you progress through the game you'll eventually be given an Ice Spear to compliment your Fire Spear. This Ice Spear also has its own unique magical powers that will be needed in order to traverse some of the trickier areas you'll come upon throughout the game. You can even use the shoulder buttons to switch between the two on the fly if necessary. Another interesting twist in navigating the levels is the ability to transform into a special creature. Each of these creatures also has its own special move set which will be needed at times to get through certain challenging sections of the game. You'll generally be given a button prompt when the time comes to make use of them and they're all fully explained as you acquire new ones during your travels. At the end of most levels you'll have to face off with the traditional boss fight and this is where the game becomes even more playable. Not only are the bosses extremely well crafted, but their patterns are equally impressive. Each boss has a specific pattern and its up to you to figure it out and exploit it. Once you've dispatched of the boss, you'll move on to the next level and be given the opportunity to upgrade your spear once again. The play controls in Soul of Darkness are nearly as smooth as those found in the DS Castlevania releases and at times offer up even more versatility in their execution. Even the level designs are very well laid out and give you plenty of opportunities to take on enemies, not to mention use your problem-solving skills to figure out how to keep progressing through them. The game also does a nice job of keeping things challenging without making the experience overly frustrating by allowing you to start at the last checkpoint you passed through when you're character dies. While this might prove to make the game a bit too easy for seasoned platforming fans, it's quite a refreshing feature for a game of this nature and only adds to the high level of fun the game offers up. As if nailing the gameplay wasn't enough, the developers also managed to put some serious time and effort into the audio/visual package and it certainly doesn't disappoint. Not only are the orchestrated musical tracks phenomenal, but the wide array of visuals that go along with them are equally stunning. This game certainly doesn't look or sound like a DSiWare release and it's impossible to not be impressed with how much the developers were able to squeeze into such a small file size. At the very least, it's easily one of the most impressive musical and visual presentations the service has seen to date. If you're going to create a clone of a game, you might as well make sure it's a great one and Gameloft have done just that. 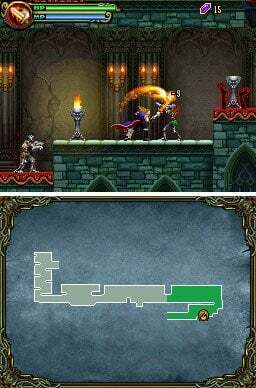 Taking many of the enjoyable visual, musical, and gameplay aspects of the DS Castlevania releases, the game molds together an absolutely terrific platforming experience that's not only extremely playable, but also wildly enjoyable as well. Sure it's a bit more condensed and linear, but this helps it function more efficiently as the DSiWare release it is. It goes without saying that if you're even the slightest bit a Castlevania fan, you absolutely have to take this wonderful title for a spin. In all honesty, the game would be a bargain at twice its 500 Nintendo Points price tag. 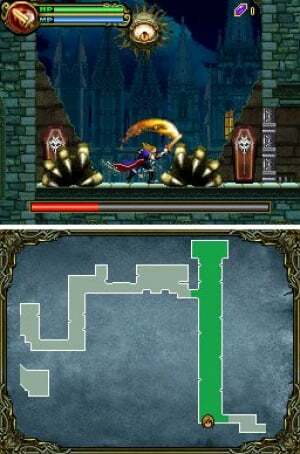 but a Castlevania clone at this price?! = Instant BUY! WHEN DOES THIS COME OUT IN THE UK? I WANT ANSWERS GAMELOFT, ANSWERS. Wow...... the tagline made it seem like a bad game but you've shocked me with a 9! Oh well, I'll get a points card for it..... after I buy Pop Island: Paperfield. Well, if it's a good game, it's a good game. Thanks Gameloft. I have this on my mobile and it's a fun game that's worth playing. I also have the game on my mobile, and I quite liked the game. Good to see the DSiWare version delivers. Congrats Gameloft. It took you 20 DSiware releases to get a great game. Hmm, this has me surprised. I may have to consider it after I pick up some other titles like Paperfield, QuickPick and Flametail. Wow. I got this for my Blackberry a couple years back and thought it was pretty fun until I beat it 45 minutes later. It sounds like they went back to it and actually made it fulfill all of it's promise. Cool. Now, do I buy it again? Never played this game before but i did download on the first day and love it just known that gameloft made this game right and would get a good score. Wow, Gameloft's first nine. If only all of their games were this quality. Now where did i put my thinking cap? Great review corbie. Really unexpected, but I'm glad to see a good new 2D platformer hit the service. I'm buying! I think I have to buy this now. Great review, Corbie. Great review. I was waiting to hear about this one and now im downloading it for sure. I was a lil thrown by the tag line as well but now it makes sense. @bboy2970: I downloaded it yesterday at 10:30 p.m., played until 12 a.m. and it said I had finished 77% of the game so my guess is it will be 2 hours if you go out of your way to find all the HP and MP crystals. So far if the game had already ended I would have gotten my 500 points worth but with at least 20-40 minutes left it is a must buy for any Castlevania fans. The Game sounds great, but I'll past if its too short. Getting this for sure, shameless clone or not. And at 5$, length is not a big deal to me. Can't really expect retail length epic at a fraction of the cost (and size limitation). So Corbie loves this one plus EdEN sures us that this isnt a short game. @ Gameloft: thanks for another good game after Earthworm Jim for the DSi! Wow, that's a suprising rating, for a Gameloft game. Interesting! I played this game on my phone, but this type of action-based gameplay really didn't work very well there, not to mention the graphics were sluggish and the loading times way too long. But it seems the DSi version turned out rather excellent. If it has more levels and variation that the mobile version, I'll get this for sure. Can't get enough of Castlevania, clone or not. Wow, this looks both shameless and awesome. Wish it were on WiiWare. I just finished 2nd level and it says 19 percent done. I would guess that there is about 10 levels. Thanks for the review on this game and so fast too. I was just wondering about this game. Now I will have to add it to my list. If it's linear, is it difficult to max out the weapons? I like doing that sort of thing and would be kind of bummed if it was made so you have to carefully choose what you can actually get by the end. Great! I was hoping this might do well. I hate how ppl hate on Gameloft so much. They have actually brought me some of my favorite games, including UNO I'll have to get this since I love the original Castlevania games. Thx. Wow! You are so right, too. I just downloaded this since the review was so fantastic and within seconds I can see the quality and level of care put into this Gameloft release. I give this one a 9/10, too, and that's just after five minutes of playing Thanks for the recommendation, I am loving this! Seems like something made for the original GBA Great! @Stuffgamer1: No backtracking since the game is separated into levels (11 if I recall properly). You get to use the purple orbs to max out the weapons but you CAN'T max both of them, at least not on Normal difficulty (might get more orbs on hard, which I'm currently playing after finishing the game but I see no difference so far orb-wise). I needed an extra 5,000 orbs for full max but you MIGHT get them if you go back and forth between screens and kill all the enemies. Will take a while. So after beating this title I would have to agree with most of GG post number 33 comment. 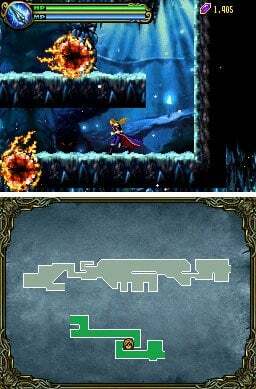 Kind short, but this platformer is just a fun as DVZ( another good DSiware game). Day-um, this review makes me wish I had a DSi. The 3DS will support DSiWare, right? Just bought this game after reading this review since I had 500 points just laying around. It's fun and addictive! should i buy this or pop island? I had a lot of fun with this game, while Pop Island felt too chaotic for me. LOVED this game. beat it twice and going on a third on hard. Gameloft are masters at great clones. I need to get this.